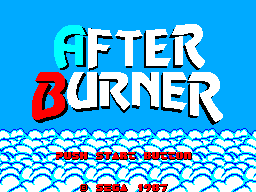 After Burner was originally released in arcade in 1987 by Sega. The game was designed by Yu Suzuki (Enduro Racer) of Shenmue fame. In the game, you pilot an F-14 Tomcat through 18 different levels. Instead of my usual format where I talk about the games features, game play, graphics, and whatnot, coming to a final conclusion at the end of a few hundred words, I am going to come right out and say it. After burner is a bad game. A really bad game. The premise of the game is simple, pilot a jet, shoot at enemies. This is where After Burner immediately falls on it's face. It's virtually impossible to tell where the enemies are in relation to your jet. 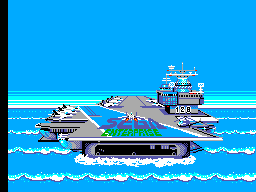 The original arcade title relied on sprite scaling hardware to smoothly transition ships from the background to the foreground. The Sega Master System lacks such abilities. So the enemies have 3 sizes: small (somewhere in the distance), medium (also somewhere in the distance), and large (somewhere in front of you). Getting behind an enemy to line up a shot is a huge gamble, you are either going to 1) get behind him and shoot him down, or 2) crash into him and die. It's also impossible to tell if an enemy is flying away from you, or towards you. So when trying to get into position to fire, the enemy may fly straight into you, again killing you. Next problem is the nature of arcade games themselves. The original arcade cabinet was a beast, featuring a huge cockpit for you to climb into (check out the second Terminator movie, where John is in the arcade in the beginning of the movie) with speakers and a flight stick. 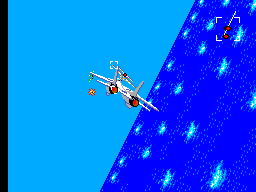 It is an exciting environment to play the game, and After Burner throws a lot of enemies and missiles at you to help capture that excitement. All of the frantic action does not translate well to a console game. The frame rate suffers bad due to the constant action. It's impossible to know what the hell is ever going on. Your F-14 is equipped with automatic rounds and missiles. The missiles can lock onto enemies and take them down. When you lock on to an enemy, you will here a high pitch chirp noise, when you here this, fire a missile to take them out. In between missiles, you need to be constantly shooting your primary weapon and pray to God you take down the enemy before you crash into him. Or he crashes into you. Though good luck figuring out which scenario brought you down. Your jet is capable of a barrel roll however, which will allow you to quickly dodge out of whatever is in front of you. In fact, just barreling left and right will get you far in this game. I made it to level 8, without looking at the screen. I kid you not. Just barrel roll left and right, constantly shooting your primary weapon, and fire a missile any time you hear the beep signifying you've locked onto the target. In fact, trying to make sense of After Burner and methodically taking down enemies is useless. Button mashing and barrel rolling is the name of the game here. Button mashing isn't fun. Dieing because you can't tell what is happening on the screen isn't fun. After Burner isn't fun. There is one good thing about After Burner, and that is the F-14 Tomcat itself. It is represented by a huge sprite in the middle of the screen, and it animates well as you dive across the screen. Ever cooler is barrel rolling, as the entire screen rotates around you. A neat trick seeing as the Sega Master System has no sprite rotating hardware either. Finally, the sound. The music is the usual 8-bit dribble with various bleeps and bloops that sounds very upbeat in nature. It isn't annoying by any stretch, but not noteworthy either. The weapon sounds are also generic, with a whooshing noise for the homing missiles, and beeps for the regular fire. After Burner could have been a decent game. Toning down the chaotic nature of the game would have not only made it more playable, but probably have helped the frame rate as well. I just can't help but be disappointed in After Burner. Yu Suzuki is an icon in the gaming industry, it's hard to believe he started with crap like After Burner. Overall, After Burner for the Sega Master System is terrible. The screen is way too busy, you can't tell if enemies are coming or going, it's hard to shoot things, and it's easy to die. The graphics are clever at best, and the soundtrack is nothing to write home about. Most offensive of all however, is the complete lack of fun when playing. Avoid After Burner at all costs.